The Dr. & Mrs. Henry T. Clark Chapter Room was a lively environment for the big sporting events that February brought. Brothers and friends were in attendance on February 4th to watch the Philadelphia Eagles take down the New England Patriots. Although the chapter room was predominantly pulling for the Eagles, there were a number of disappointed Patriots fans that endured defeat. In addition to the Super Bowl watch party, the brothers of the Psi Chapter hosted another viewing event for the UNC/Duke rivalry game on February 8th. 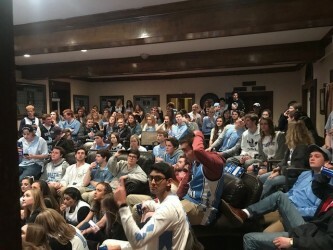 As is standard for most Duke-games, the chapter room was packed to the brim with Tar Heel fans who anxiously pulled the Heels to an 82-78 victory over our hated rivals. Following the mad rush to Franklin Street, brothers and UNC fans alike celebrated the victory late into the night. We are looking forward to the next Duke-game on March 3rd, where we’ll have a day party at our house leading up to a similar game viewing in the chapter room.